What is maximum unambiguous range? The maximum unambiguous range (Rmax) is the longest range to which a transmitted pulse can travel out to and back again between consecutive transmitted pulses. In other words, Rmax is the maximum distance radar energy can travel round trip between pulses and still produce reliable information. If t < T then the return signal arrives before the next pulse has been emitted. If t = T then the return signal arrives exactly when the next pulse has been emitted. If t > T then the return signal arrives after the next pulse has been emitted and there is an ambiguity, ie the radar cannot tell whether the return signal has come from the first or second pulse. In Figure 1, the first transmitted pulse, after being reflected from the target in 200 km, is received by the radar before the second pulse is transmitted. There will be no ambiguity here as the reflected pulse can be easily identified as a reflection of the first pulse. But in same Figure, we notice that the reflection of a target of the first pulse is received after the second pulse has been transmitted (in range of 400 km). This causes some confusion since the radar, without any additional information, cannot determine whether the received signal is a reflection of the first pulse or of the second pulse. This leads to an ambiguity in determining the range, this received echo signal be mistaken as a short-range echo of the next cycle. Therefore maximum unambiguous range Rmax is the maximum range for which t < T.
The greater the pulse repetition frequency fp (in pulses per second), the shorter the pulse repetition time T (interpulse period) and the shorter the maximum unambiguous range Rmax of the radar. Rmax must be greater than the Maximum Display Range (so called: instrumented range). Consider a radar with pulse repetition frequency 1 000 Hz. The pulse period is its reciprocal value and is 1/ 1 000 = 1 ms. According to formula (2) the maximum unambiguous range of this radar is 150km. If the radar receives an echo signal with a run time of 100 µs, is this a unique or ambiguous target? Answer: That cannot be answered in this way. This target with an ostensively run time of 100 µs can be originated from a distance of 15 km, as well as from a target of 165 km. Only vice versa do we get an unambiguous result: A range of 15 km from a real target would be an unambiguous result and would have a runtime of 100 µs. What is second time around echo in radar? Bild 2: With a staggered pulse repetition frequency, a second sweep echo does not have a stable position to the following pulse period. 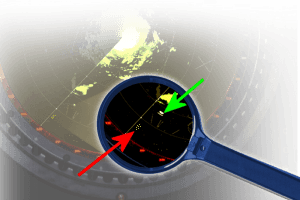 The pulse repetition time (PRT) of the radar is important when determining the maximum range because target return-times that exceed the PRT of the radar system appear at incorrect locations (ranges) on the radar screen. Returns that appear at these incorrect ranges are referred as ambiguous returns, second-sweep echoes or second time around echos. By employing staggered PRT the target ambiguous return isn't represented any more by small arc on an analogue display. This movement or instability of the ambiguous return is represented typically as a collection of points in certain equipment because of the change in reception times from impulse to impulse. With this distinction, a computer controlled signal processing can calculate the actual distance. (thin longer arc – IFF Reply; thick shorter arc – return by the primary radar) and ambiguous IFF-reply by using a staggered PRT (collection of points). Figure 3 shows a target return by the primary radar (thick shorter arc) and an IFF answer reply of the IFF interrogator (thin longer arc) and a second sweep answer of the IFF by using staggered PRT on an PPI-scope. Here you can see as well, that the interrogator doesn't use every primary synchronous-pulse. (The appearance of ambiguous IFF-returns can be reduced by using a decreased Tx-power of the interrogator.) Now by using fixed PRT one would expect to see ambiguous returns confusably similar to the unambiguous returns (arcs). More modern 3D- radar sets with a phased array antenna (like the RRP-117) don't have this problem with an ambiguous range. The system computer steers the transmitted beams so that ambiguous returns from the previous pulses are not received while the antenna beam points in another direction. If the radar uses intrapulse modulation and uses a different waveform in each transmit pulse, the maximum unambiguous measuring distance is of no significance for the radar. Each received echo signal can be assigned to exactly its origin (the individually transmitted pulse) and thus the run time over several pulse periods can be measured. 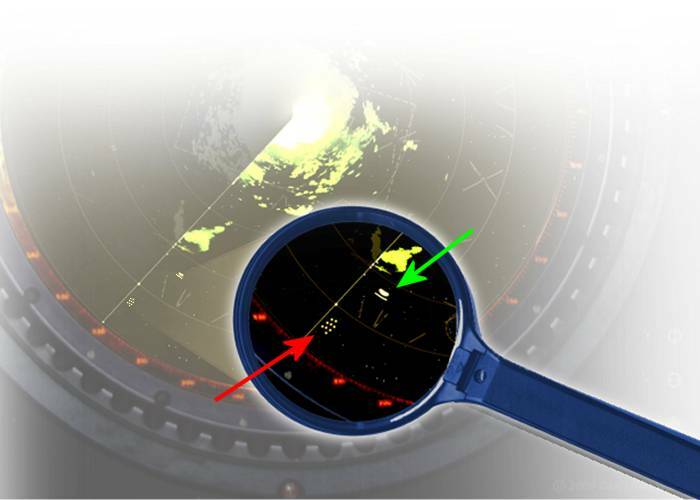 Radar sets in satellites for the remote sensing of the earth can, however, also represent targets at the correct distance, if they are actually ambiguous. The general height of the orbit is known, so only a distance can be measured that differs by a few kilometers from the height of the orbit. Compared to Fig. 1, this means that at an altitude of 400 km only the measurement result received in the second pulse period can be valid.